I liked the characters. All of them. 'Specially Nick “Not the Backstreet Boy” Carter. He was admirably normal, considering the maelstrom of weirdness that exploded around him when two aliens come to him and tell him the Universe, capital U, has been pirating Earth’s music for decades and now, according to Earth’s laws, they owe so much money in royalty fines that Earth now owns the accumulated wealth of the Universe, capital U.
I liked the plot. How rare is it to read an alien-law-music-piracy-strange story and find it interesting and appealing? Very rare. Most law based books are dramas and dreary and meh. And still. After all that I liked the characters (except Carly and Frampton, too stupid at some points for me to like them like them), the story, the plot, the dialog, the twists, the weirdness, still, after all that - it didn’t grab me. It didn’t make me WANT to read it. It’s not by ALL means a bad book. It just wasn’t the book for me. It may be that I was distracted by work. Or that I wanted to read the book I was going to read after this one so bad I just wasn’t able to focus on this one. Or maybe something else. The thing is that I didn’t quite enjoy the book, however much I liked all aspects of it separately. Very rarely does this happen to me. I usually LOVE A BOOK, OMG GO READ IT NOW OMGOMGOMG. Or I dislike it and stop reading it, drop my kindle (carefully onto a soft plushy surface, I’m not stupid) and go wash my eyes and hands of the awfulness. But this lack of interest makes this book something rare for me. A book I liked in my head, but didn’t grab my emotional fanboy strings. I will read the second book. Mostly because I’m intrigued by the story and what’s coming. But I don’t know. Mixed feelings. Anyways. Weird review, eh? Just because I didn’t quite like it doesn’t mean you wouldn’t. And I would recommend it if you liked The Hitchhiker’s Guide To The Galaxy, as it does have a taste of it. So go forth and experience for yourself what this book is like. If nothing else the ending will make you go WHAAAAAAAAAAAAT?!?!? I forgot to mention that! The ending. Holy crap I didn’t see that coming. Strike all that I said before. Read it, if only for the ending. I feel stupid now. The ending makes up for all the rest. Crap. Now I have to re-write this review. 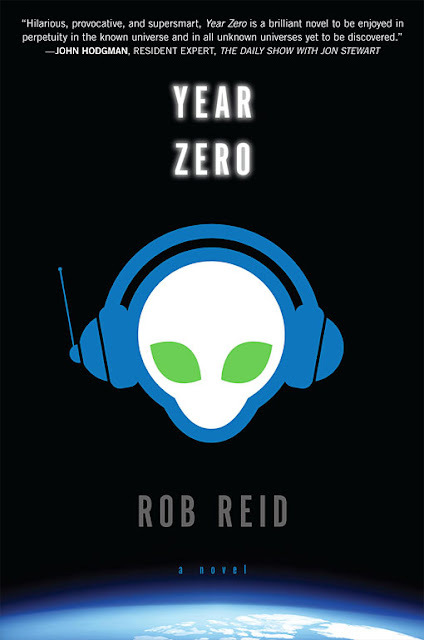 Go forth and buy your copy of Year Zero today! Even the synopsis sounds strange ;) Definitely unique though!